In recent years, increasing attention has been paid to instances in which employees may be in a position to report on wrongdoing within their workplace. In recognition of the potential risk to whistleblowers from disclosing wrongdoing, and in recognition that the public interest often can be better served by lowering the risks from making such disclosures, many jurisdictions have introduced specific legislation that is intended to provide protection to whistleblowers, particularly those who work in the public sector. There is widespread agreement - even in Alberta - that whistleblower protection is desirable. Yet there are several issues that must be resolved in the design of whistleblowing legislation. A key issue is the very definition of whistleblowers and whistleblowing. Various law dictionaries and academics put forward a range of proposed definitions. One of the broadest holds that whistleblowers are “those who disclose information about something they believe to be harmful to the public’s interest, occurring in business or in government. It includes disclosure to authorities within the organization, to outside agencies or to the media.” Other definitions focus on whistleblowing in workplaces, or even more narrowly, public sector workplaces. Wrongdoings can be also defined more narrowly to include such specific categories as financial impropriety, criminal activity or harassment. The breadth of definition adopted for whistleblowing will have an important bearing on the type of whistleblower protection that is provided. Another key issue that goes to the heart of whistleblower protection is the balance that needs to be struck between an employee’s duty of loyalty or “fidelity” to the employer on one hand, and freedom of expression and the public interest in disclosure of wrongdoing on the other. These three values have deep and pervasive roots in our society, and reaching the right balance is a delicate task. It is clear, however, that failure to provide comprehensive protection to whistleblowers is not a balance at all. A very practical issue is the identity of the designated authority for receiving disclosures of whistleblowing. Apart from assuring anonymity for whistleblowers, that authority will need to be independent and effective in order to encourage whistleblowers to come forward. Although governments are loathe to move on this point, it appears obvious that situating the receiving authority within the department in which the complaint arises will not lead to effective whistleblower protection. A final key issue is the degree of comprehensiveness of whistleblower protection. Disclosure of wrongdoing can be advanced in some instances by a patchwork of specific rules and policies. However, in order to develop confidence on the part of potential whistleblowers, and a culture of disclosure of wrongdoing, comprehensive legislation is required. These issues have been addressed to varying degrees in whistleblower regimes in different jurisdictions. The federal government has adopted whistleblower protection policy, and has introduced bills in the House of Commons twice. The Internal Disclosure Policy (IDP) has been in place for a few years, and has already faced serious criticisms, including internal criticisms, not least for its failure to provide strong, independent mechanisms for receiving disclosure and for oversight. In light of recent notorious scandals concerning wrongdoing in the public sector, it appears the IDP is not achieving its goals. Two recent bills have been introduced in the House of Commons. Bill C-25, although still problematic, contained an improved system in many respects. It did not pass during the 37th Parliament. Bill C-11, which is quite similar to Bill C-25, is currently under review in the 38th Parliament. Tellingly, the Public Service Alliance of Canada (PSAC), whose members stand to gain the most from federal whistleblower legislation, did not support this bill because of its design shortcomings. Whistleblower protection has also been introduced over the past decade in Australia, the United Kingdom and the United States. Their approaches have varied, but are generally more comprehensive than Canada’s federal IDP and the federal legislation introduced to date. Australia now has whistleblower protection legislation federally, in both territories and in all states. The Australian State of Queensland’s legislation has very broad coverage of activities that constitute wrongdoing, and enables disclosures by not only public sector employees, but also nonemployees in certain cases. However, the disclosure generally must be within the department in which the perceived wrongdoing occurred. In the UK, the Public Interest Disclosure Act applies to the private sector as well as the public sector. Apart from this, and an easier mechanism for obtaining redress against reprisals, it is similar to the Queensland legislation. In the United States, the Whistleblower Protection Act (WPA) in 1989 provided relatively early protection for whistleblowers. The Act provides for disclosure to a variety of entities, including the Office of the Special Counsel (OSC), the Inspector General of an agency and any other individual or organization, including the media, provided the disclosure is not prohibited by law. However, there have been criticisms leveled at the lack of investigative powers and weak leadership of the OSC. New senate legislation, as yet not passed by Congress, would address this shortcoming. The 2002 passage of the Sarbanes-Oxley Act, in response to corporate corruption exposed in scandals such as Enron and WorldCom, created protections for corporate whistleblowers. The majority of states have whistleblower protection legislation. Whistleblower protection in Canada at the provincial level is somewhat less advanced. Currently, there is some notional degree of whistleblower protection in every jurisdiction in Canada. A patchwork of rules in the common law, the Charter of Rights and Freedoms, collective agreements, and specific statutes such as employment and environmental protection legislation in some provinces provide some redress for some whistleblowers in some circumstances. However, this patchwork has incomplete coverage, and fails to provide the assurances needed to encourage potential whistleblowers - who also face many social consequences - to come forward. Alberta would seem to be ready for whistleblower protection legislation. 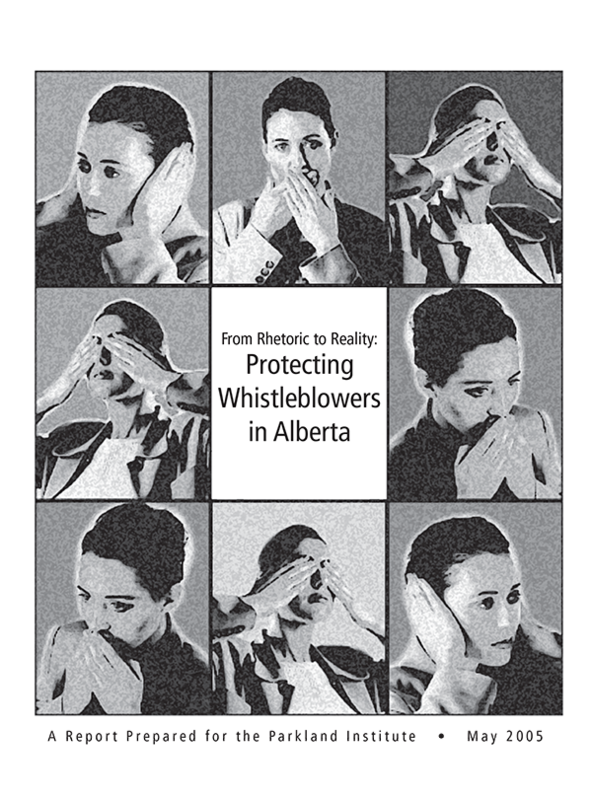 Albertans are known to have a significant interest in issues of governmental accountability, and the Alberta government is on record as supporting increased protection for whistleblowers. The government defeated a private members whistleblower protection bill in 1998 because it did not like the bill’s design. Yet the government has not introduced its own bill since that time. The public interest in accountable government would be enhanced by adopting whistleblower protection legislation. And doing so also would provide an opportunity for the province to take a leadership position among Canadian provinces on this timely issue. The various models that exist internationally, federally and provincially constitute a wealth of design ideas and experience from which Alberta could draw in order to create its own legislation.